Pneumonia, a respiratory disease that kills about 50,000 people in the United States every year. Rapid detection of pneumonia is critical for effective treatment, especially in hospital-acquired cases which are often more severe. MIT scientists have now built up a nanoparticle-based innovation that could be utilized to enhance the speed of diagnosis. This sort of sensor could likewise be utilized to screen whether antibiotic treatment has effectively treated the contamination. Through this new study, scientists wanted to explore the possibility of diagnosing infection by detecting proteases that are produced by microbes. They began with a species of bacteria called Pseudomonas aeruginosa, which can cause pneumonia and is a particularly common cause of hospital-acquired cases. Pseudomonas expresses a protease called LasA, so the researchers designed nanoparticles with peptides that can be cleaved by LasA. The analysts additionally built up a second nanoparticle-based sensor that can monitor the host’s immune response to contamination. These nanoparticles are shrouded in peptides that are divided by a kind of protease called elastase, which is created by immune cells called neutrophils. In a few patients with pneumonia, regardless of whether an antibiotic gets out the microbes causing the contamination, a chest X-ray may at present show inflammation since neutrophils are as yet dynamic. Utilizing these two sensors together could uncover whether an antibiotic has cleared the contamination, in situations where a chest X-ray still shows inflammation after treatment. Scientists also showed that if they treated mice with an ineffective antibiotic, both bacteria levels and inflammation levels stayed high. This kind of test could help to reveal whether an antibiotic is working, in cases where a patient’s symptoms haven’t improved within a few days. 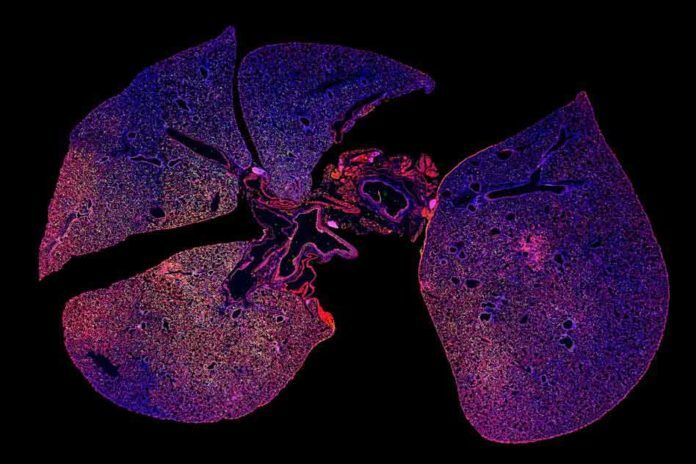 For this study, scientists conveyed the nanoparticles intravenously, however they are currently taking a shot at a powdered form that could be breathed in. Bhatia imagines that this methodology could be utilized to decide if a patient has bacterial or viral pneumonia, which would assist specialists in deciding if the patient ought to be given anti-infection agents or not. The complete test, growing a bacterial culture from hacked up bodily fluid, takes a few days, so specialists base their choices on the patients’ indications and X-ray imaging — a procedure that may not generally be precise. Scientists are now working on adding peptides that could interact with proteases from other types of bacteria that cause pneumonia, as well as proteases that the host immune system produces in response to either viral or bacterial infection. The researchers are also working on sensors that could easily distinguish between active and dormant forms of tuberculosis. Graduate student Colin Buss and recent Ph.D. recipient Jaideep Dudani are the lead authors of the paper, which appears online Nov. 29 in the journal EBioMedicine. Reid Akana, an MIT senior, and Heather Fleming, director of research for Bhatia’s lab, are also authors of the paper.